Major #BrushFire | Grant County, Washington | New! Date + Time Started: A major brush fire broke out around 1920 hours PDT on Sunday evening. Location: The fire is located in the Frenchman Coulee area near I-90, Mile Marker 142, about 4 miles East of the Vantage Bridge. Fire Resources: The following Agencies have been dispatched and are currently en route: Grant County Fire District 5, 10, 11, 13 and Ephrata Fire Department. Law Enforcement Agencies: Washington State Patrol (WSP) has currently shutdown all Westbound traffic, while Eastbound is currently open time-being. Traffic Closures: WSP has shutdown WB traffic on I-90, while EB is open but Law Enforcement is asking to seek out an alternate route around the area. UPDATE | 1942 PDT | Both directions are NOW closed. WSP trying to clear vehicles stuck in between of end of the closures. 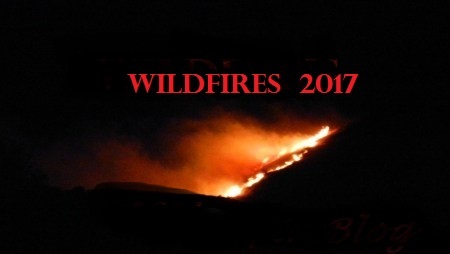 Hashtags: We are using the following hashtags #FrenchmanCouleeFire #WAwildfires2017 #I90Fire #VantageFire NOTE: There has not been an official name for this brush fire. Our Social Media Channels: Check us out on Facebook or on Twitter (@nwfireblog).